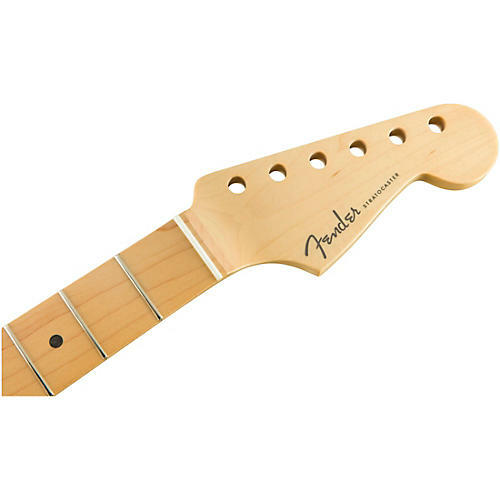 Genuine Fender replacement neck with modern playability. Crafted in the same facility as Fender's U.S.-made instruments, the American Elite Series neck offers the best of both worlds by combining top-of-the line, classic Fender design with the modern, smooth playability of a Fender compound-profile neck. A modern “C”- shape at the nut, the rear of the neck morphs along the length of the neck to a modern “D”-shaped profile at the neck heel. A thoughtfully contoured 9.5”–14”-radius fingerboard gives players outstanding comfort and seamless movement along a satin urethane finished neck. Setups and adjustments are a breeze with the 2-way adjustable truss rod at the heel, without the need for special tools. Fender recommends a Fender Authorized Service Center to install the American Elite Series neck, as it may be necessary to modify the body to install due to the truss rod adjustment wheel placement. Upgrade your favorite guitar with this great-playing neck. Order today.